By admin , in Arthritis on April 6, 2019 . Psoriatic arthritis is an inflammatory type of arthritis caused by a chronic skin disease called psoriasis. Psoriasis causes patches of red, irritated skin on which flaking silver or white scales develop. To define psoriatic arthritis, one must understand that the word psora means “itch” in Greek; therefore, psoriasis means “itchy.” As discussed throughout this volume, the term arthritis concerns joint disorders, wherein the prefix arthron means “joint” and the suffix it is means “inflammation” in Greek. Thus, the term psoriatic arthritis refers to joint inflammation caused by the itchy skin disease called psoriasis. Psoriatic arthritis is also called arthritis psoriatica, psoriatic arthropathy, or arthropathic psoriasis. Patients with the condition are first diagnosed with psoriasis, then with psoriatic arthritis, usually within a span of ten years. The severer the skin symptoms, the greater the chance of developing psoriatic arthritis. In some rare cases, patients develop arthritic symptoms before the skin condition, and in other extremely rare cases, only arthritic conditions develop with very little or no skin disease. The relationship between psoriasis and psoriatic arthritis is still not understood completely. Not everyone with psoriasis will develop arthritis, but people with psoriatic arthritis will have psoriasis too. Psoriasis and psoriatic arthritis are autoimmune diseases, which means that the body’s immune system starts attacking healthy cells and tissues as if they were harmful foreign bodies. In psoriasis, the body’s immune system sends out signals telling the skin cells to grow rapidly, resulting in thick red patches that ultimately shed flakes. This immune response is thought to extend to the joints and lead to inflammation and swelling. The cause is still a mystery. Synovium lines the joints and produces synovial fluid, which lubricates the joint and helps in its movements. In an autoimmune disease, the white cells attack synovium and result in its malfunctioning. This causes synovium to produce thick, sticky synovial fluid, causing swelling and inflammation. This ultimately damages the joint cartilage, narrowing the space between bones. Psoriatic arthritis can cause permanent joint damage and disability if not properly managed and treated in a timely manner. Psoriasis and psoriatic arthritis are thought to be caused in some cases by a certain genetic makeup. Those with the genetic marker HLA-B27 are at greater risk for developing both psoriasis and psoriatic arthritis. Other possible causes are deep cuts and traumatic sunburns. It is believed that physical trauma can erroneously provoke the body’s immune system. Other environmental factors such as bacterial or viral infections can also initiate a faulty immune response in people with an inherited tendency toward psoriasis. Emotional stress can worsen psoriasis and increase the risk of psoriatic arthritis. Alcohol use and smoking have also been found to trigger psoriasis. Hormonal changes may aggravate the condition, increasing the chance of developing psoriatic arthritis. Allergic reactions to medications can stimulate inherent psoriasis, and disorders such as autoimmune deficiency syndrome (AIDS) can reduce the effectiveness of the immune system. Successful treatment can only begin after a disease has been correctly diagnosed. A large number of people throughout the world are coping with psoriatic arthritis. It is a long-lasting disease with no cure. Treatments are aimed at reducing the symptoms of the disease once it has been diagnosed. Symptoms include both the skin issues and the joint problems. Both can be sources of extreme discomfort and pain for the patient. In order to diagnose psoriatic arthritis, doctors use a number of screening techniques as no single test can confirm the condition. 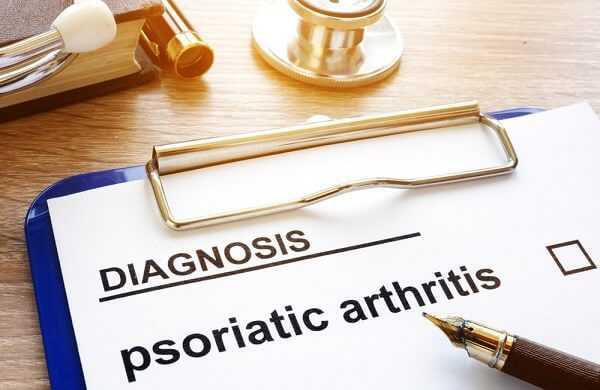 Diagnosing psoriatic arthritis can be a tricky business because the symptoms come and go and are common to other diseases. Diagnosis is usually based on elimination method. An important aim of screening is to distinguish between the more than one hundred different types of arthritis. Symptoms sometimes overlap; for instance, joint pain and inflammation are common features of most types of arthritis. Therefore, only careful screening can diagnose the disease correctly. Then further action, such as administering medication and physical therapy, is possible. Immediately on noticing symptoms of psoriasis, a person must visit a doctor. The following sections discuss screening and testing for psoriatic arthritis. • When were the symptoms first noticed? • Has any member of the family had similar symptoms? • Does any immediate family member (father, mother, sibling, or child) have psoriasis? • In which joint(s) is the pain felt? • Are the joints stiff in the morning? Knowing the patient’s medical history can help the doctor reach an accurate diagnosis in a short time. Evidence suggests that an early diagnosis and appropriate treatment thereafter can prevent potential disability. Therefore, a patient must fully cooperate with the doctor and relate his or her medical history correctly and with as much detail as possible. A physical examination done by the doctor is crucial to psoriatic arthritis diagnosis. In the majority of cases, symptoms of psoriasis, when coupled with arthritis symptoms and related complaints by the patient, can confirm psoriatic arthritis. The physician looks for red patches of inflamed skin with a scaly surface. If they are not visible on the exposed portion of the skin, the physician may look for them in hidden places, such as the scalp, umbilicus, genitalia, and perianal areas, where psoriasis can go unnoticed. If psoriasis is found on the skin of the patient, the fingers and nails are examined next. Psoriatic arthritis usually affects the nails of the patients at an early stage of the disease. The physician may also examine the joints to look for any tenderness, swelling, stiffness, and inflammation. X-rays of the affected joints reveal the extent of joint damage. They sometimes help distinguish between different types of arthritis. 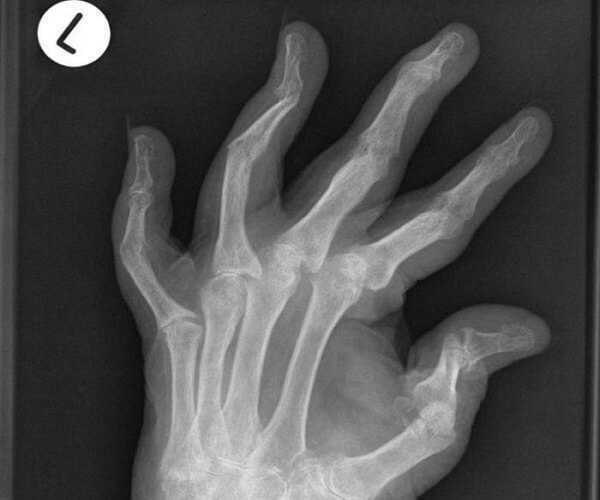 Psoriatic arthritis has an erosive effect on the bones, giving rise to a classic “pencil-in-cup” deformity: Changes in the joint space and signs of deformity may not be visible on an X-ray in the early stages of psoriatic arthritis. Blood tests are mostly done to rule out other conditions. A test for rheumatoid factor (RF) is done to differentiate between rheumatoid and psoriatic types of arthritis, as RF is present in the former and absent in the later. If RF is found in the blood, psoriatic arthritis is ruled out, and further testing is done to confirm rheumatoid arthritis. An erythrocyte sedimentation rate test is used to determine the degree of inflammation. Blood tests may also reveal the presence of the genetic marker HLA-B27 in almost 50 percent of the people with psoriatic arthritis. This almost always confirms psoriatic arthritis. A small amount of fluid is extracted from the affected joint and analyzed to help distinguish between gout and psoriatic arthritis. If the patient has gout, there will be a high amount of uric acid in the extracted fluid. Bone density scans are done to check for bone loss, a characteristic of psoriatic arthritis.